Rising government spending for upgrading existing infrastructure combined with new projects especially in countries such as Indonesia and Malaysia, and budding utility projects (Hydropower & Thermal Power) in Laos, Cambodia and Thailand have resulted into growing demand for construction equipment in South-East Asia region. Moreover, signs of economic recovery in several South-East Asian countries associated with increase in inflows of FDI have resulted into growth of construction market. 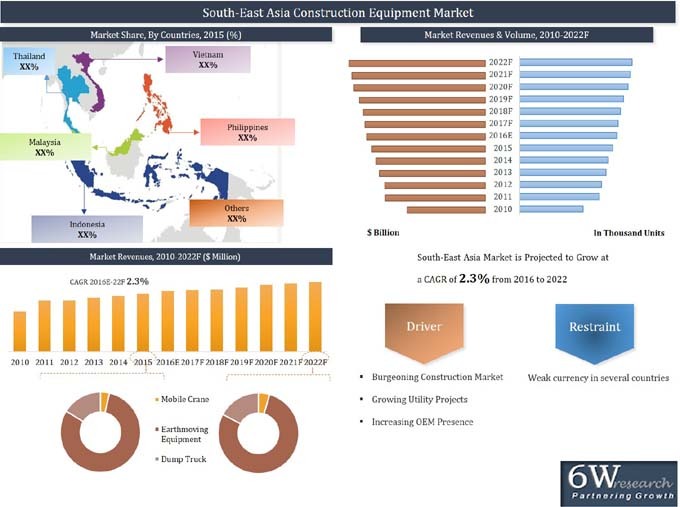 According to 6Wresearch, South-East Asia construction equipment market is forecast to grow at a CAGR of 2.3% during 2016-22. Several Chinese equipment manufacturers have started targeting South-East Asian market, which has resulted into decline in prices of equipment due to growing competition. Amongst all applications, construction application segment accounted for majority revenues share in the region followed by mining and utility applications, respectively. Also, Indonesia held majority of revenues share in the overall South-East Asia construction equipment market owing to increasing infrastructure developments and commercial construction. However, during the forecast period, Vietnam and Philippines are expected to exhibit highest growth rates. The report thoroughly covers the market by construction equipment types, applications, countries, and regions. The report provides unbiased and detailed analysis of the on-going trends, opportunities/ high growth areas, market drivers, which would help stakeholders to device and align market strategies according to current and future market dynamics. 52.4	Hitachi Construction Machinery Co., Ltd.
52.5	Tadano Asia Pte Ltd.